Lessons differ slightly depending on the student. In general, it starts with scales for intonation or working on vibrato, moves on to an etude or exercise, and culminates with work on a piece of music. But not every student works well with this method, so I will add in some musical worksheets and ear training games for those that require lessons with more variety. Hobart Middle School is located in a poor section of Los Angeles. A wonderful teacher by the name of Rafe Esquith has made it his mission in life to give the students lucky enough to be in his classroom an education filled with music, art, and fun. These students put on a full-length Shakespearean play at the end of each school year complete with music and choreography. I am the cello teacher for interested students. I started with 2 students the first year and it has expanded up to 5 this year with more hopefully to come. As a private cello instructor, my job is to teach new or continuing cellists how to play and how to improve on the cello. I look for ways to make learning interesting by including music the student wants to play, even if that means arranging a popular piece myself so that it is more accessible for the student's level. I am the cello coach for this middle school orchestra. At the beginning of the year, I demonstrate the cello to orchestra students so that they realize there is another instrument to play besides the violin. Then we take a few days for all the students who are interested to try out the cello with me as their guide. If they are interested, then the rest of the year I am the coach that comes in once a week to help the newer students get a handle on the orchestra pieces, since most cannot afford a private instructor. I was the cello coach for the string, symphony, and chamber orchestras. I was responsible for helping the cellists prepare the more difficult spots in the orchestral pieces. I am the cellist of the Porta Caeli Chamber Ensemble. 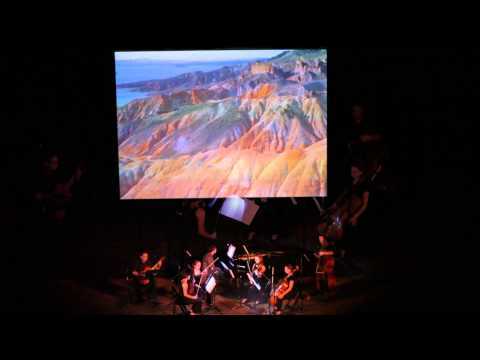 Here we are playing the soundtrack to the film "Deserts." 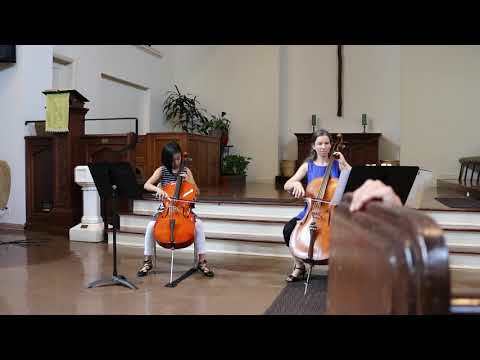 A student performing "Gavotte in C Minor" for my yearly cello recital. 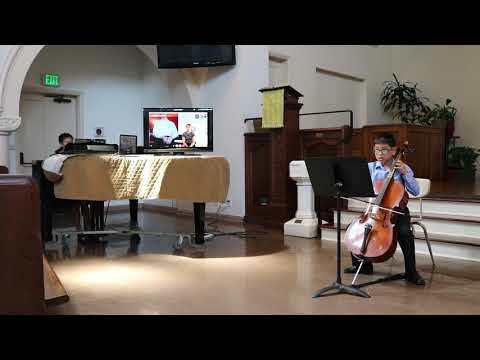 A student performing "At Twilight" for my yearly cello recital. Jessica is definitely the best! I got this as a gift to my wife. She thoroughly enjoyed her lesson. She had an hour lesson, but was enjoying it so much, she did not realize an hour has passed. Thank you to Jessica for being such a great teacher. My 13 year old daughter said "She loved her" totally different as her Cello teacher in middle school, she said. Excellent, patient instructor. She didn't let my bad habits go unchallenged, giving me kind and consistent correction. The seemingly small corrections to form reduced fatigue and improved my playing. She was always great at communication. The best part for me was she did not insist I as an older adult learner practice from an elementary book. She suggested interesting pieces and studies that challenged me without overwhelming. Highly recommend Jessica for all age levels. Absolutely amazing, patient great teacher. I had no idea taking lessons over the internet could be so fun! Great, patient teacher. Can't wait for my next lesson! My daughter (12 yo) really loves her lessons with Jessica. We're been impressed with her -- she makes the lessons fun and instructive. Thanks! Already off to a good start!! Jessica is an awesome teacher for my 8th grader. She has an excellent lesson plan which she has catered to my daughters skill level. Jessica is flexible in helping her learn school assigned music pieces and has given her the one on one attention and tips that she was lacking with school orchestra. The online classes have been easy and convenient. I'm so glad we signed up. Great attitude, very experienced and patient. Great teacher, took time to make sure I was doing everything very well before I left my first lesson. Jessica got Chloe off to a good start. And, she's so excited to to learn more. Jessica is an amazing teacher. I thought it would be difficult to do music lessons online. But this is PERFECT! I can't believe how much I learned in my first lesson - her tips were great! Can't wait for more. I am an adult beginner, who was a bit intimidated by online lessons, but had no other options locally. I'm so glad that I found Jessica! She is both patient, and supportive; she is highly adept at finding what works for the individual, and personalizes instruction based on what you need to improve. She is also very accommodating, and understanding when there are scheduling changes. I look forward to my lessons every week; they are so much fun! My daughter was looking for a cello teacher but we could not find anyone local that would fit her schedule. After reading several reviews we decided to try Jessica Greenly, even though I wasn't entirely sure if the online lesson model would work for someone who had never played the cello before. I was happily surprised after the first couple of lessons to see how Jessica was patient and engaging. My daughter has made great progress with Jessica and I would recommend her to anyone looking for a great cello teacher. I should also mention that Jessica has been also very accommodating and willing to work with us to manage eventual changes in schedule when we needed it. Thank you so much Jessica. Jessica is a fantastic teacher and very accommodating. From the first lesson I noticed a significant improvement in my teen daughter's playing. We happened to be in her area when we were looking to purchase a better quality cello and she met us at the store to help advise our decision. My 11-year-old daughter has had lessons with Jessica for about three months and has learned so much from Jessica. Prior to these online lessons, our daughter started learning cello with a local teacher for about 3-4 months. The teacher stopped giving lessons unexpectedly and we couldn't find a replacement so decided to go online. Doing music lessons online with someone you haven't met in person can seem daunting, but Jessica has figured out how to come across over Skype as fully present, engaged, positive and encouraging. We almost feel as if she's there in person. She can pick up on many things by asking the right questions and follows through with proper advice and recommendations for improvement. At one point, our daughter had concerns with wrist pain and Jessica fully took it upon herself to look into the matter. Jessica is very timely and flexible. At times we've had to adjust the schedule and she was quite accommodating. She also had to work with our daughter's solo performance at school and amazingly in less than 2 months prepared her for the piece. We highly recommend. After only two sessions I am so glad to have found Jessica. She is patient, observant, helpful and so encouraging. I was unsure how online cello lessons would work but this is the ideal format for me. Jessica is able to observe form and offer gentle suggestions how as well as instruction on sound. I wish I was able to take the lessons in person with Jessica because there are a couple limitations to Skype (such as a slight lag and inability to have seamless dialogue or duets) but Jessica obviously knows how to deal with these technical problems. I highly recommend Jessica and am sure that with her help even an old, slow returning cellist will soon be enjoying playing complex music. Finally, Jessica has been very flexible with my crazy schedule lately. An awesome person and great instructor. I took up the cello in my late 20's and am finally back taking lessons after a few years, so I had developed a lot of bad playing habits. Jessica really helped to deconstruct my technique and is helping me rebuild a stronger foundation on which to perform. She is also dependable regarding emailing and texting when needed. I would definitely recommend her! My 9-year-old son has been taking cello lessons with Jessica for about 4 weeks and it has been a great experience. Jessica is very professional and competent teacher, always being on time, communicating in a very fun and engaging way, and assigning homework very clearly. Andrew very much enjoys the classes and, as a result, he is even more motivated to play the cello. I would highly recommend Jessica. Jessica is an excellent instructor! She really has patience with our 7 year old and makes things easy to understand. It's been so fun taking lessons from Jessica. She is interested in finding out the student's learning method and tailors the lessons accordingly. I'm on week 3 and I'm enjoying myself so much! I was a little nervous about taking lessons through Skype, but she's been able to teach me almost seamlessly, of course there's some difficulties because she can't get a 360 view of how I'm playing, but that's something we can accommodate to. Jessica is wonderful! I began studying the cello as a quite older student - in my 50s - and have had a few teachers over these last 15 years. When teaching an adult student, the teacher has to understand that our lives, schedules and demands are quite different that those of a young person. Jessica's patience, persistence and genuine good humor in the face of my busy life is beyond admirable. Even though I am quite challenged in finding practice time, she "puts up" with me and my showing up to lessons with minimal preparation. I've accepted that I'm never going to be the great cellist of my dreams, but Jessica is facilitating my learning to enjoy playing this wonderful instrument that I've had a deep love affair with for many years. I can't thank her enough. I am the director of the Hobart Shakespeareans at Hobart Middle School in Los Angeles and hired Jessica as the cello instructor for my students. Jessica is a real pro. She is on time, organized, and a terrific communicator of ideas. My students love working with her. My son has been taking weekly cello lessens from Jessica over a year now and he really likes her. She is very talented, nice and patience. She will write down what he learned and needs to practice on a notebook every time. She is always on time and good at responding right away if I need to communicate with her. There are many qualified teachers around but it is hard to find one that has the quality I mentioned. Professional and Experienced Cello Teacher!! Jessica has been teaching cello classes for my 8th grade daughter who wanted to learn cello during summer and join school Orchestra team in good level. Jessica has been very professional, patient and always on time. She adjusts her teaching depending on the kids pace of learning. My daughter was able to pick up all the basics which she missed during one school year in eight weeks. She always checks home work and encourages kids to complete their homework. Her way of teaching certainly helped my daughter not only gain good knowledge but interest in learning more. Ms. Greenly is absolutely a wonderful cello instructer. She is experienced, encouraging,and patient. She knows exactly what my son needs to work on. I really like how she encouges nicely to work on detailes in phrases, pitches, etc..her friendly and patient approaching always works! Thank to Ms. Greenly, my son has made it to the top chamber orchestra in middle school this fall. It is not easy to find a great teacher but we feel we are the lucky ones.